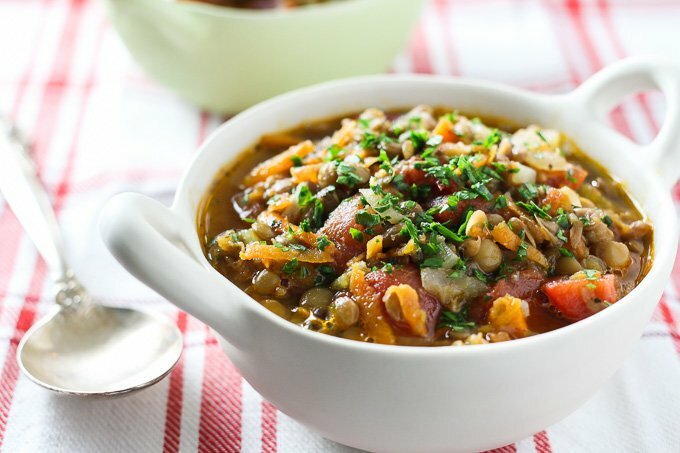 This Greek lentil soup is very filling and comforting. 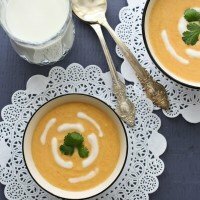 It’s a hearty soup that you can cook on the weekend and then enjoy all week long. 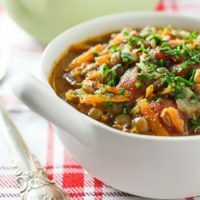 Even though this Greek lentil soup is meatless, I promise that you won’t miss the meat because this soup is full of protein and fiber from lentils and vegetables. 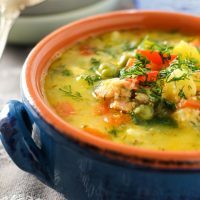 The combination of protein and fiber makes this Greek lentil soup very filling so that it can be eaten as a meal. 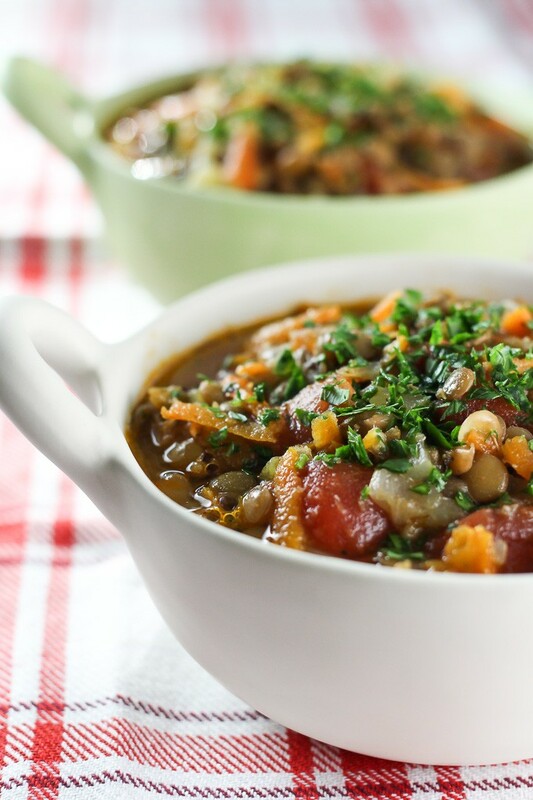 In addition, this lentil soup is also naturally gluten-free. 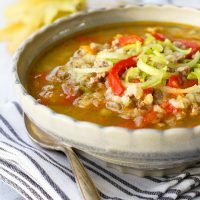 And as a bonus, this Greek Lentil Soup Faki is super budget-friendly. 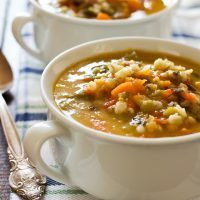 All you need are some green lentils which are on the list of my favorite inexpensive low glycemic foods, carrots, celery, onion, some spices and green herbs and you have a big pot of soup to keep you happy all week long. 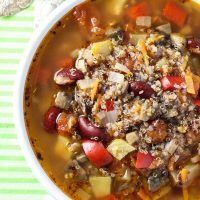 This Greek lentils soup is also quite easy to make and is perfect for beginner home cooks. 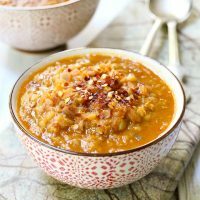 If you like lentil soups, make sure to check out this Red Lentil Soup with Coconut Milk and this Spicy Red Lentil Soup. 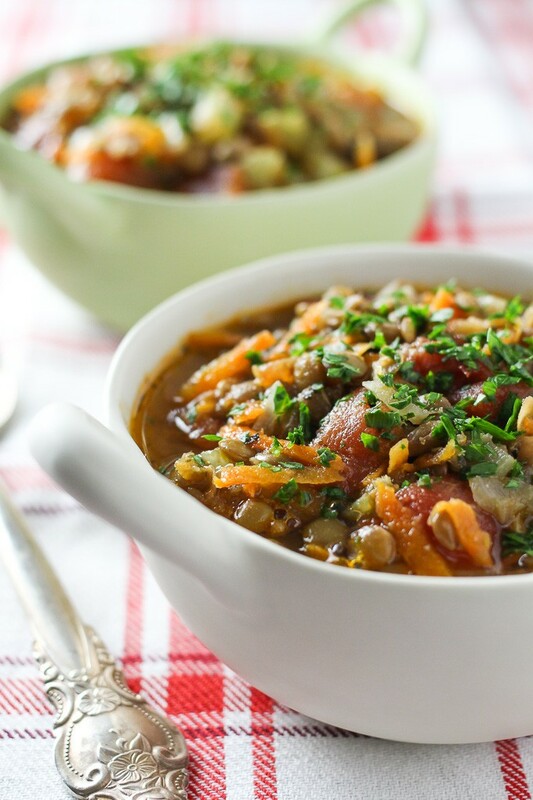 This Greek Lentil Soup Faki is full of veggies and protein. It’s healthy, filling, and comforting. A budget friendly recipe that is super easy to make. Add the vegetable stock, water and lentils to a large pot. Bring to a boil. Reduce heat. Cover and cook for about 30 minutes until the lentils start to soften. In the meantime, heat 2 tablespoons of olive oil in a skillet over medium heat. Add the carrots, celery and onions. Cook stirring occasionally for about 6 to 8 minutes or until the vegetables start to soften. Add the tomatoes, vegetables, garlic powder and dried oregano to the lentils. Season with salt and pepper. Bring to a boil. Reduce heat. Cover and cook for about 25 to 30 minutes until the lentils and veggies are cooked through. Serve with fresh herbs such as cilantro or parsley. Nutrition information is a rough estimate for 1 serving. Can this soup be frozen? 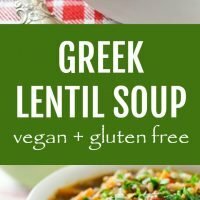 I love lentil soup but my kids won’t eat it and not sure my husband would eat this. Yes, it can be frozen and should keep well in the freezer for up to 3 months.